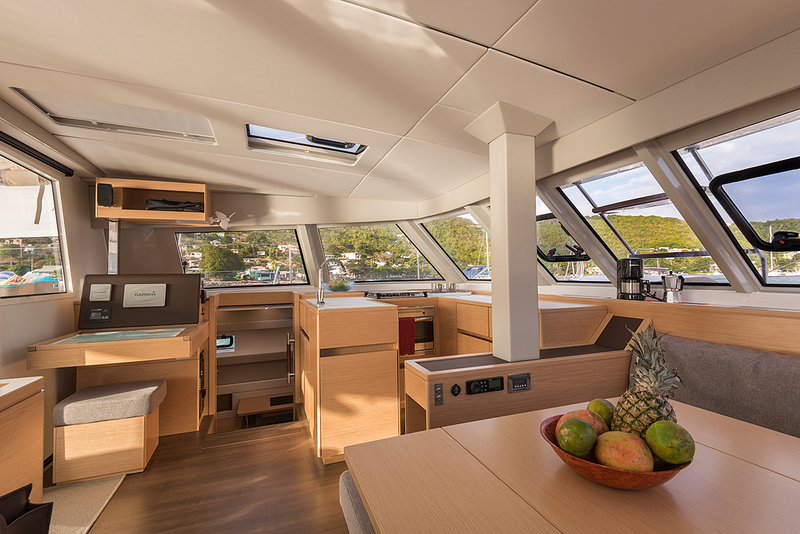 The joy of lying at anchor, or sailing at speed from bay to bay – with the NAUTITECH OPEN 46 owners version you can experience all this without sacrificing comfort or luxury. 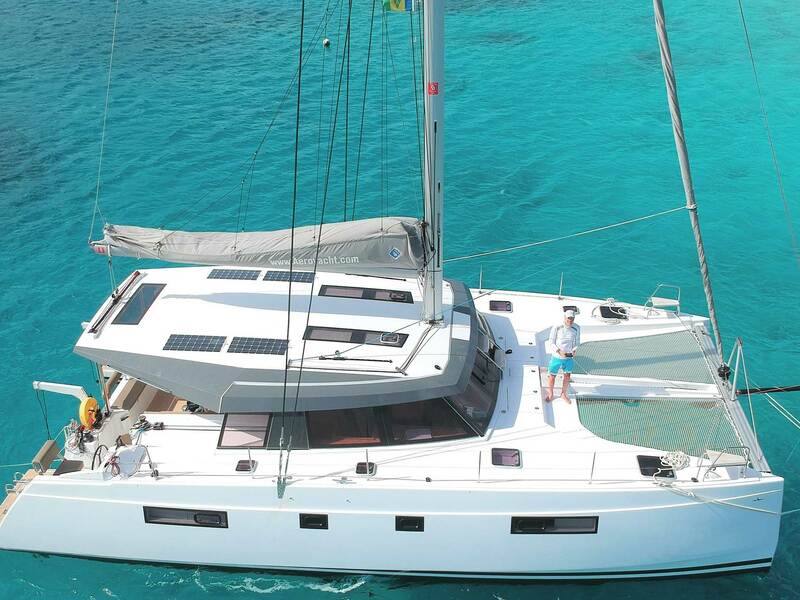 Welcome to Flo she is a delightful owners version Open 46 catamaran. 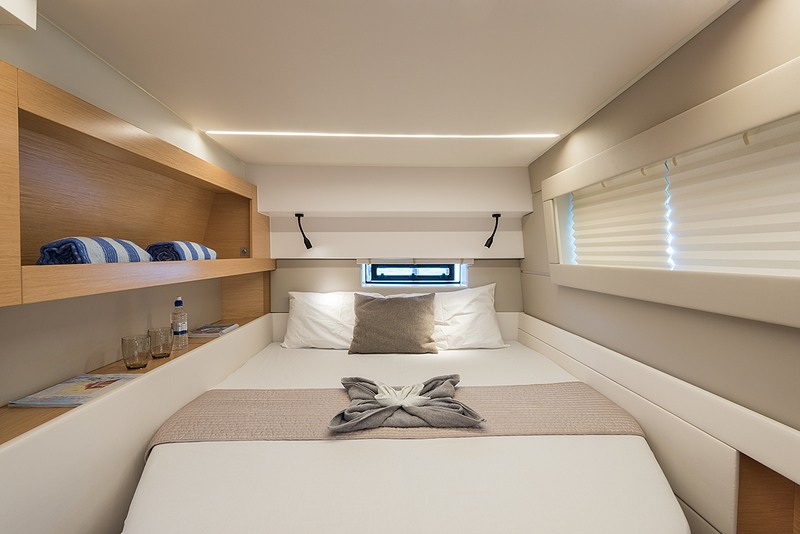 The spacious cockpit and luxurious saloon become one living space. 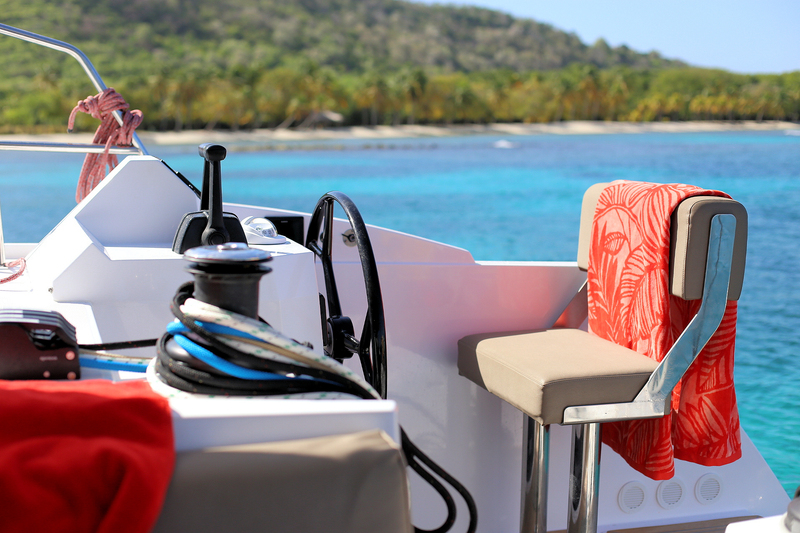 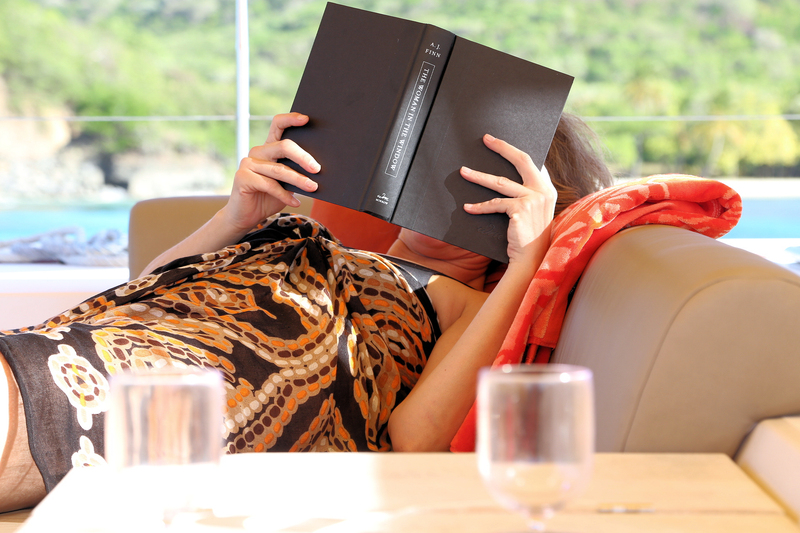 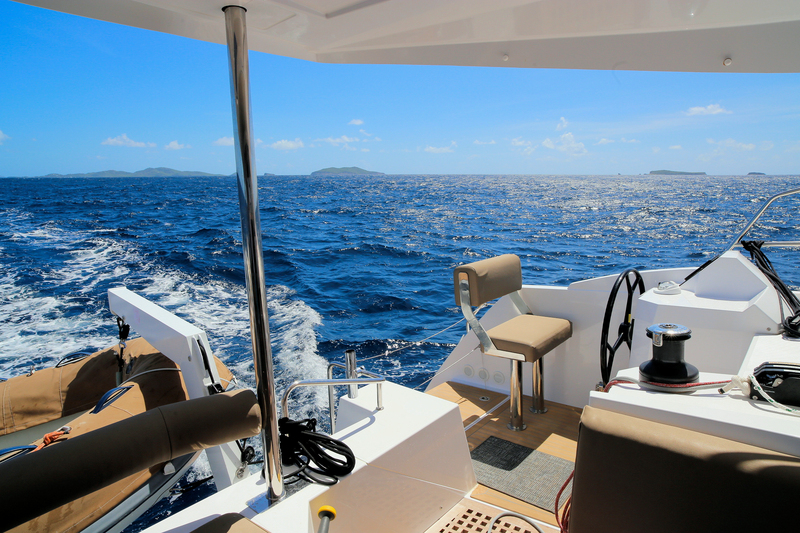 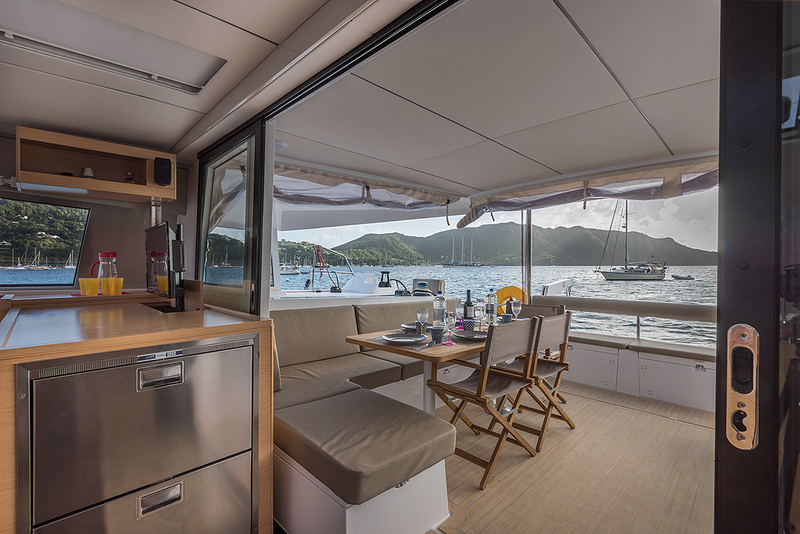 Time to talk, time to rest, time for friends, time for yourself –the NAUTITECH OPEN 46 has it all. 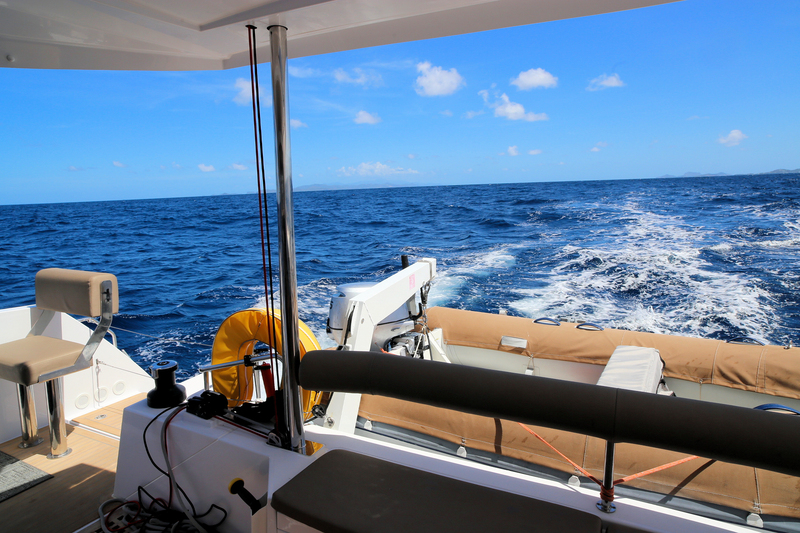 Why an OPEN 46 ? 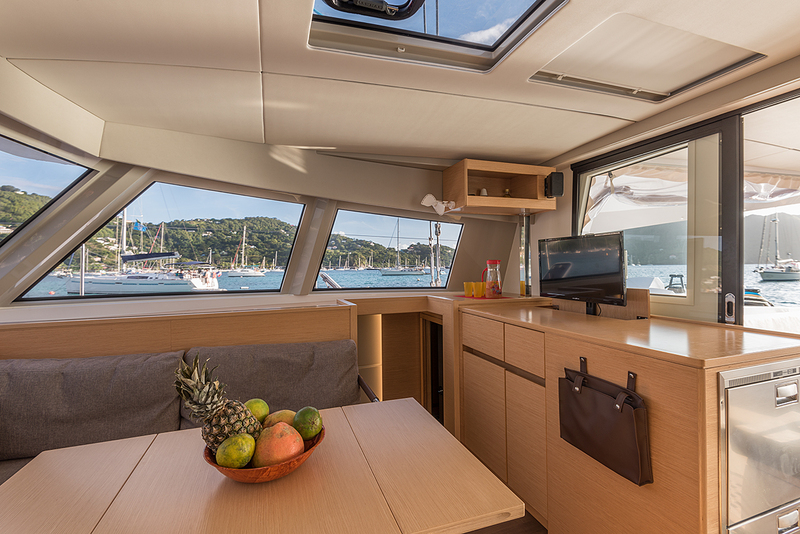 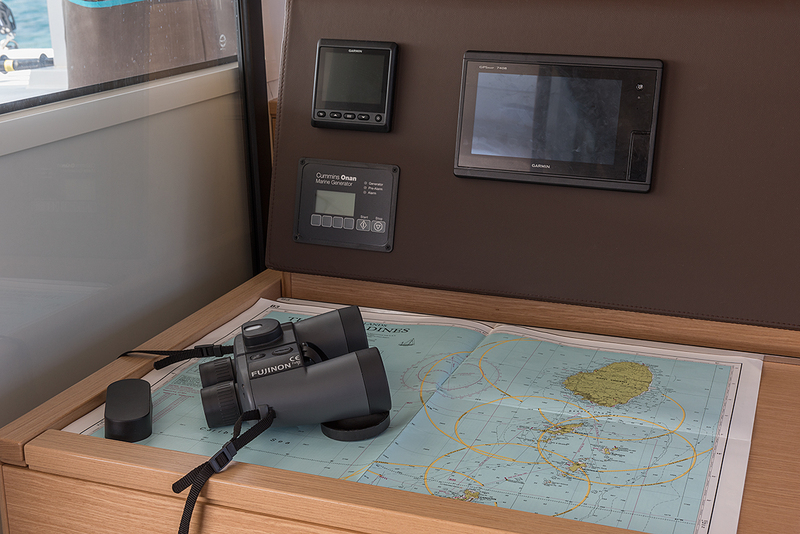 Life aboard a NAUTITECH OPEN 46 is comfortable with plenty of space for spending relaxed hours at sea. 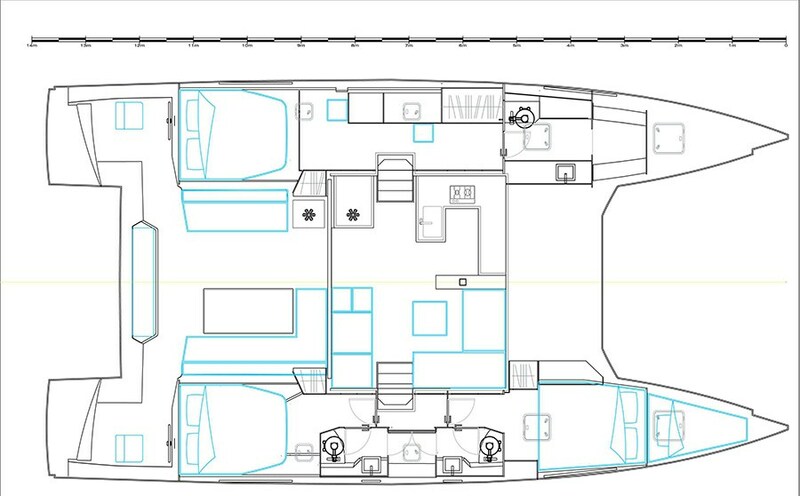 The cockpit can be coupled with the large saloon and galley. 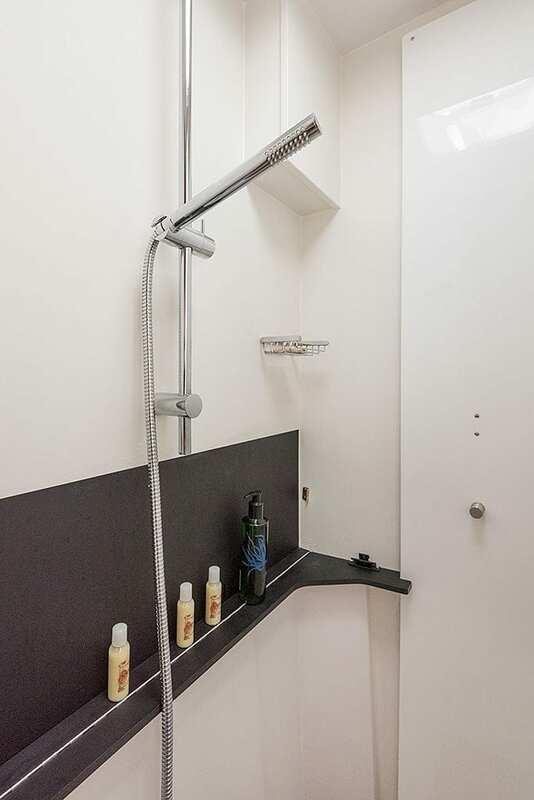 Combined they provide a single area with plenty of space. 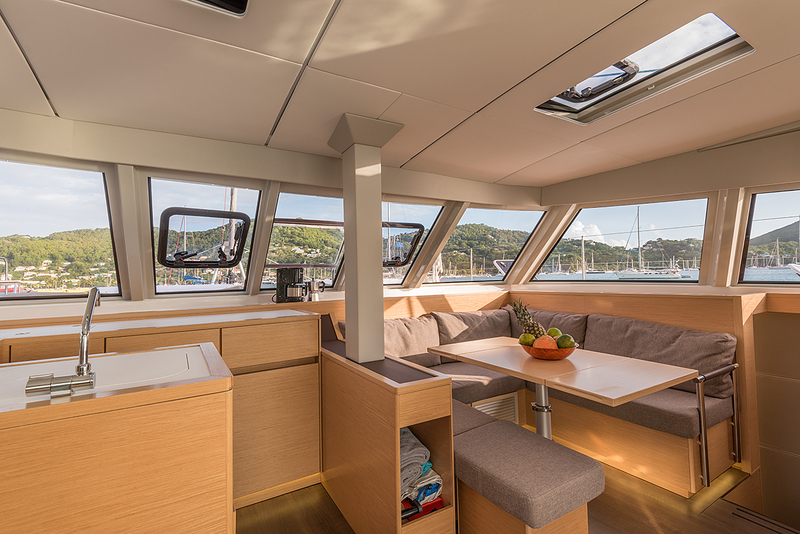 Dinner with friends and guests all happens on one level around a large dining table. 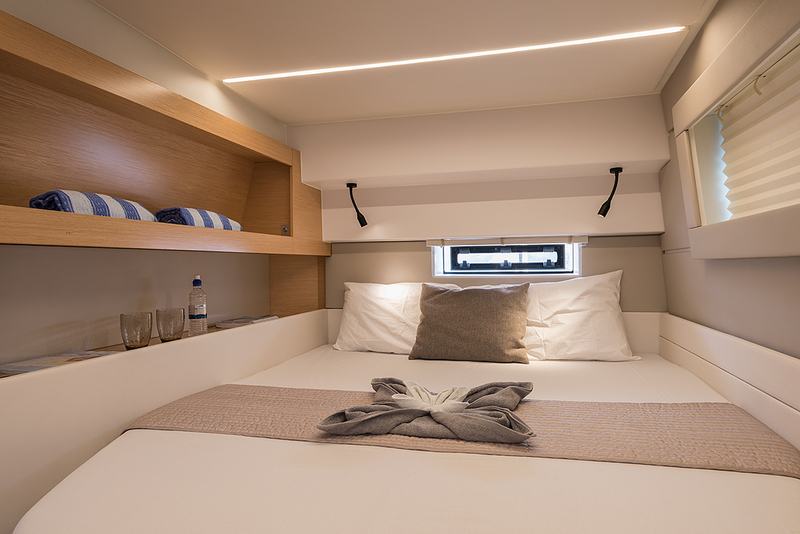 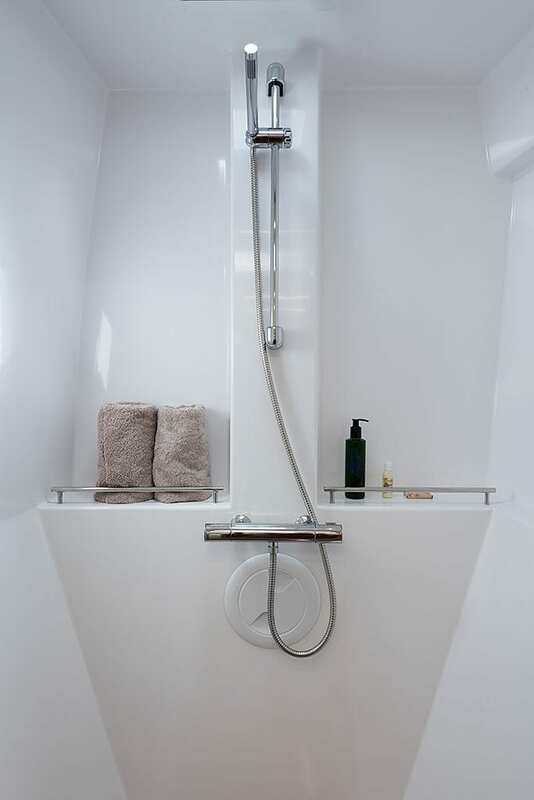 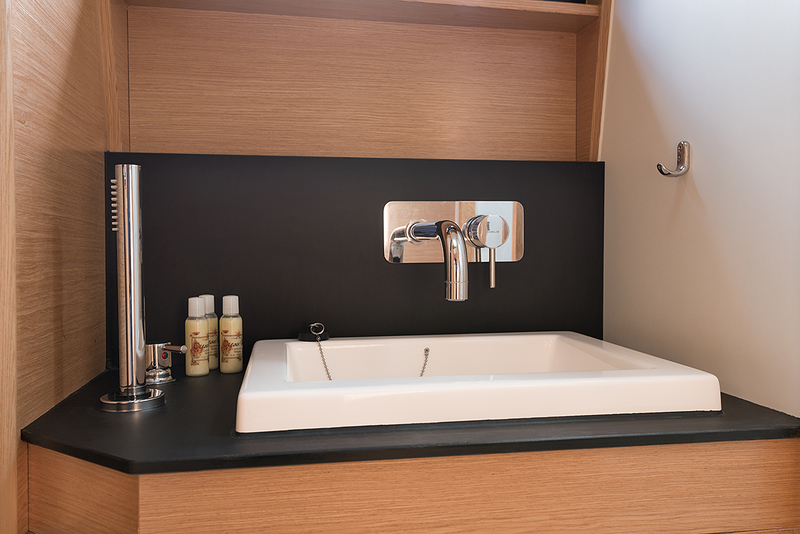 Flo is a 3 three-cabin owners version, one hull is a suite with bedroom, work space, shower and bathroom and of course plenty of storage space. 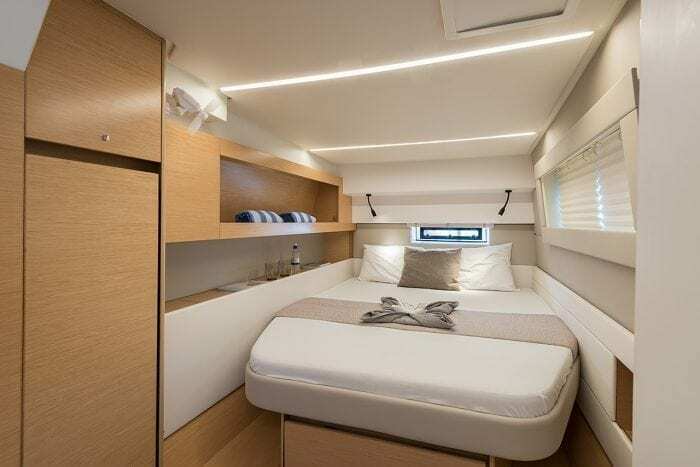 The second hull has two large bedrooms, it goes without saying that a large bathroom with shower and all the associated comforts are a matter of course. 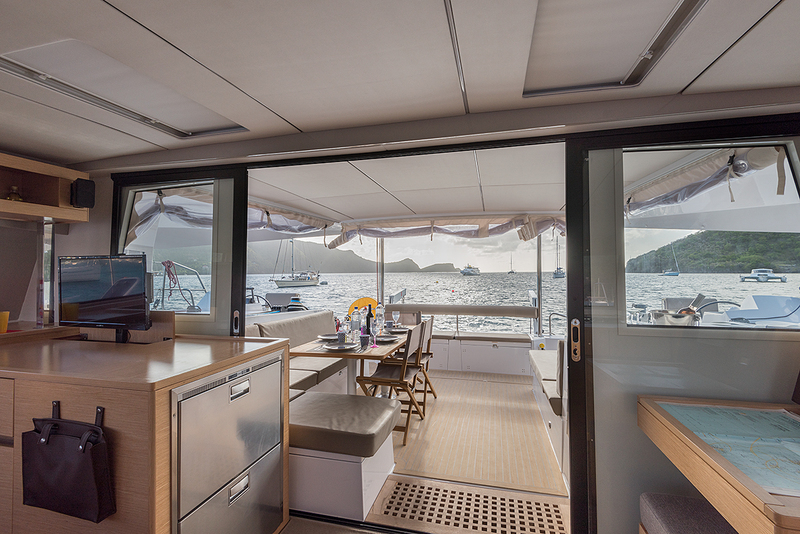 The fore-peaks provide additional accommodation for guests, crew, or skipper. 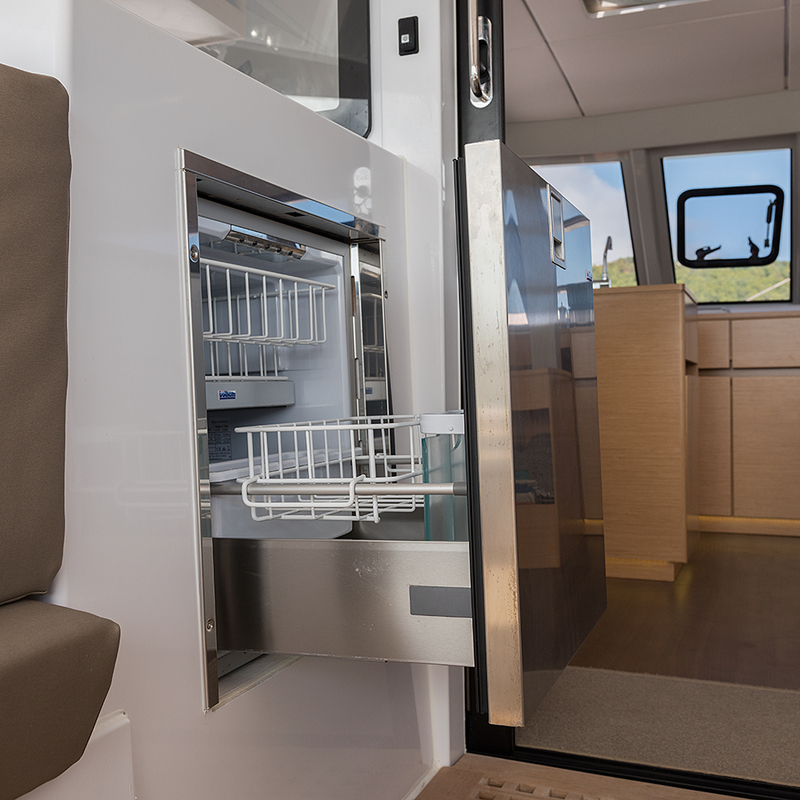 The cabins offer superior natural lighting, luxurious fit and finish (LEDs, inner planking) and the presence truly useful storage. 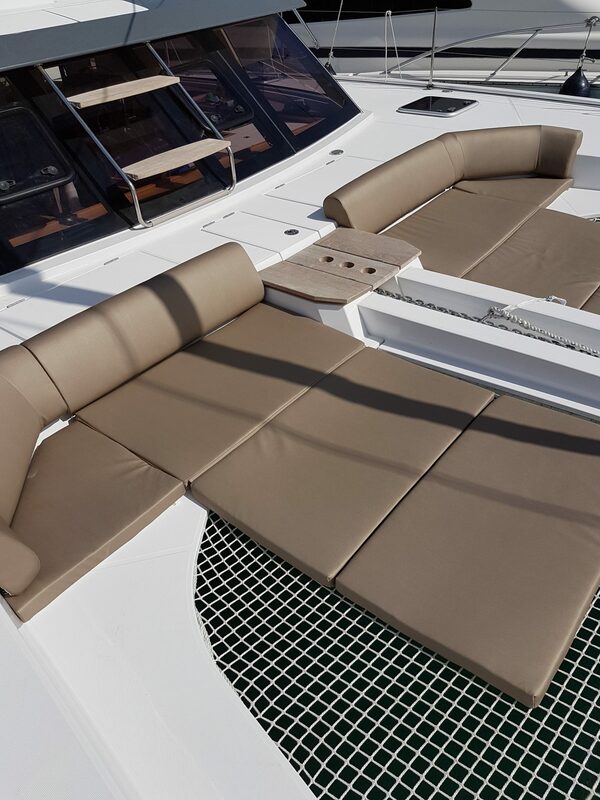 In view of the higher standards of comfort and safety and the improved quality of life, open catamarans are the ideal type of yacht for people who value a relaxed life at sea. 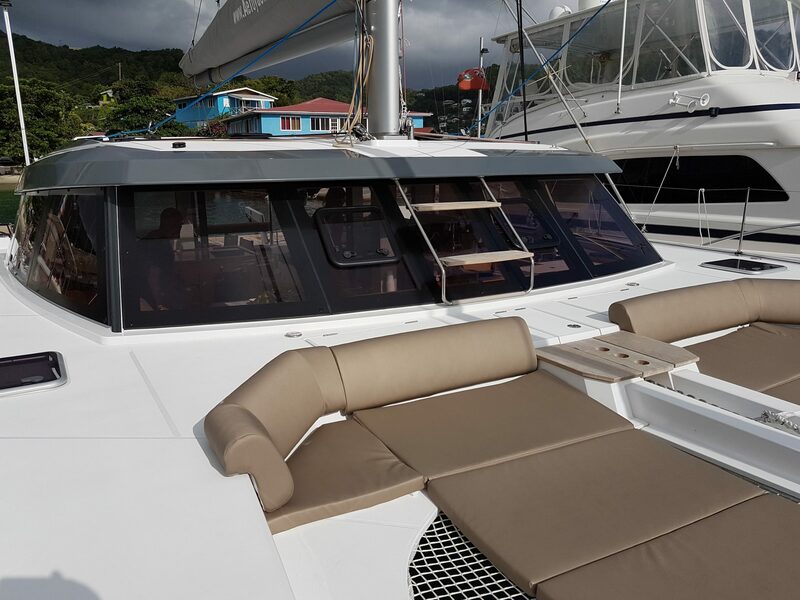 The catamaran has a generator, AIR CONDITIONING and WATERMAKER as well as plenty of sunbathing space and shade if required. 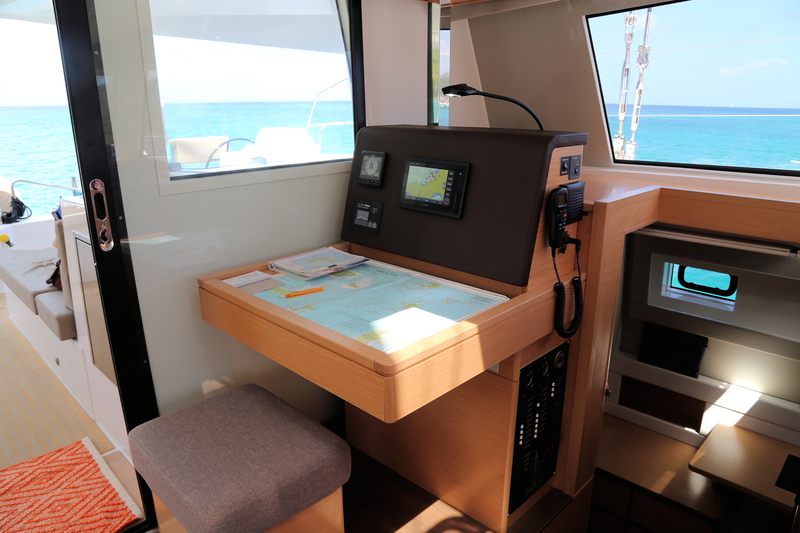 FLO has a fully shaded cockpit area and has a wide open sunbathing and steering deck. 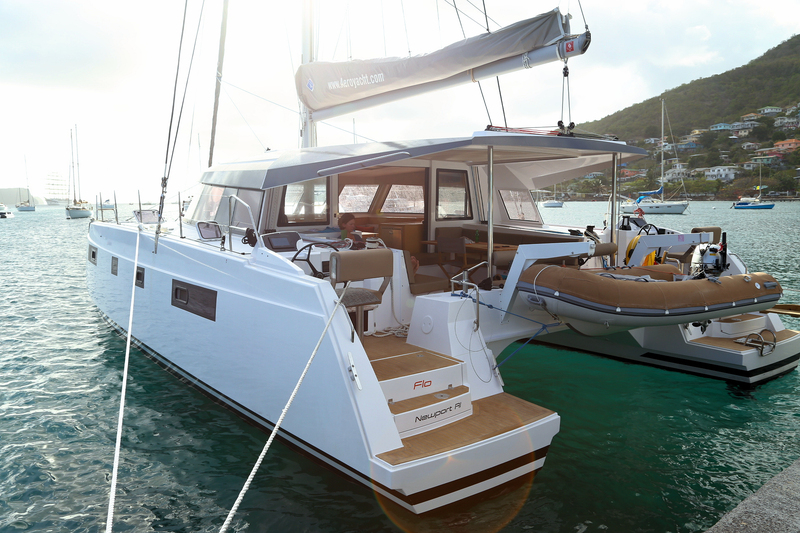 This luxurious catamaran is the perfect combination of open space and stability. 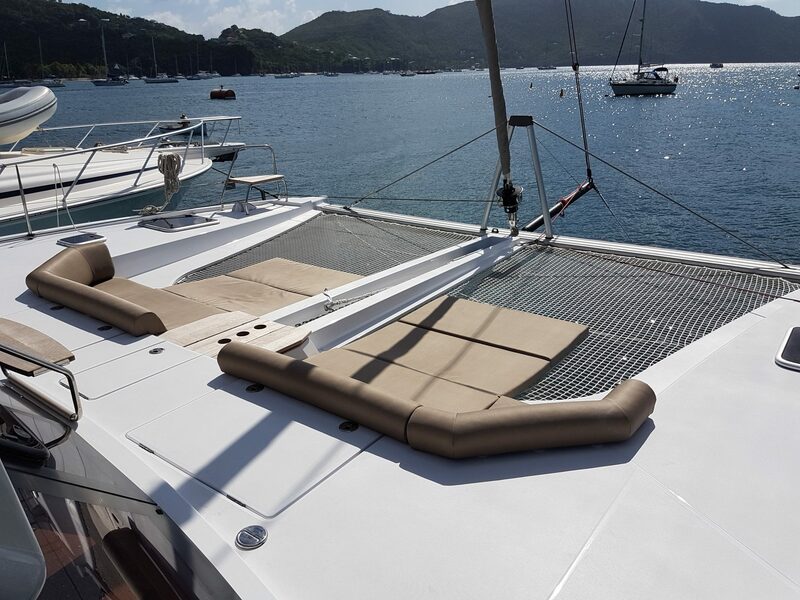 Normally based in Bequia this Open 46 is available for skippered, crewed and bareboat catamaran charter in the Grenadines. 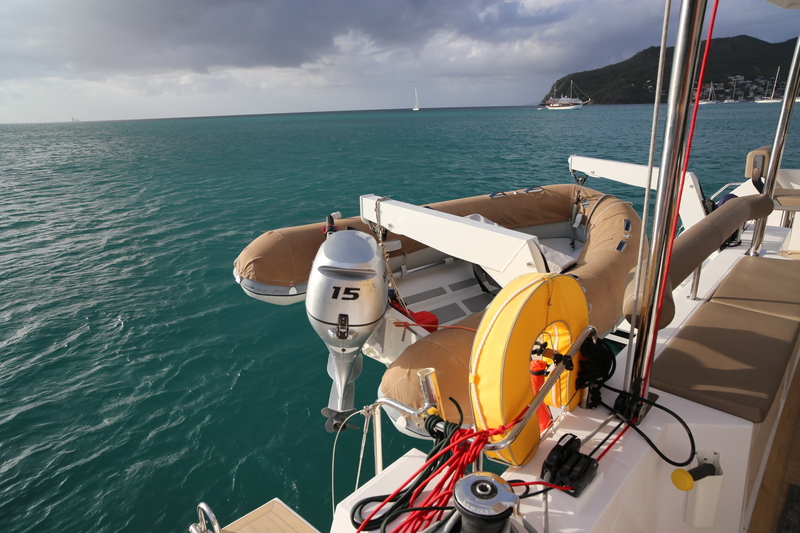 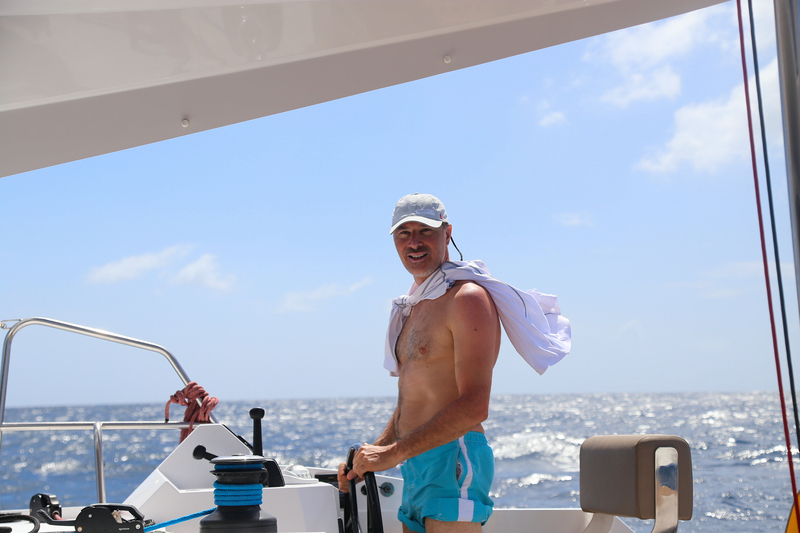 Other start or finish locations are available such as St Lucia or Grenada. 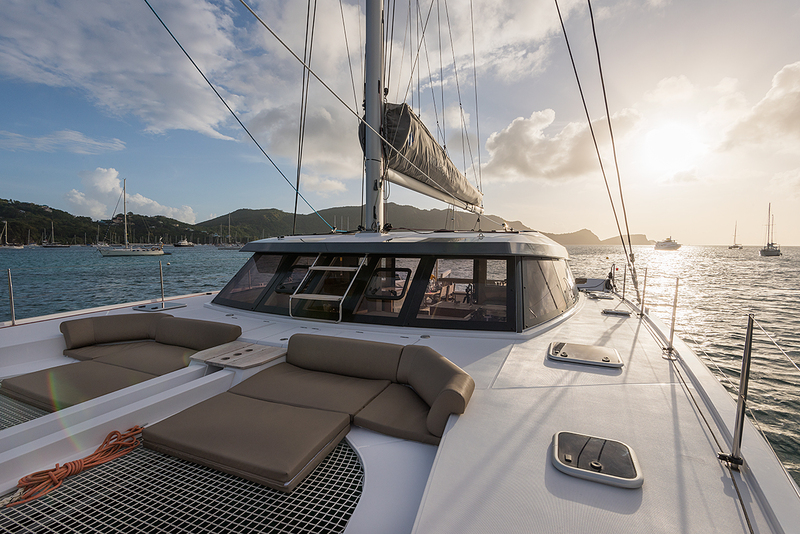 Contact us now to discuss your options and customise your charter. 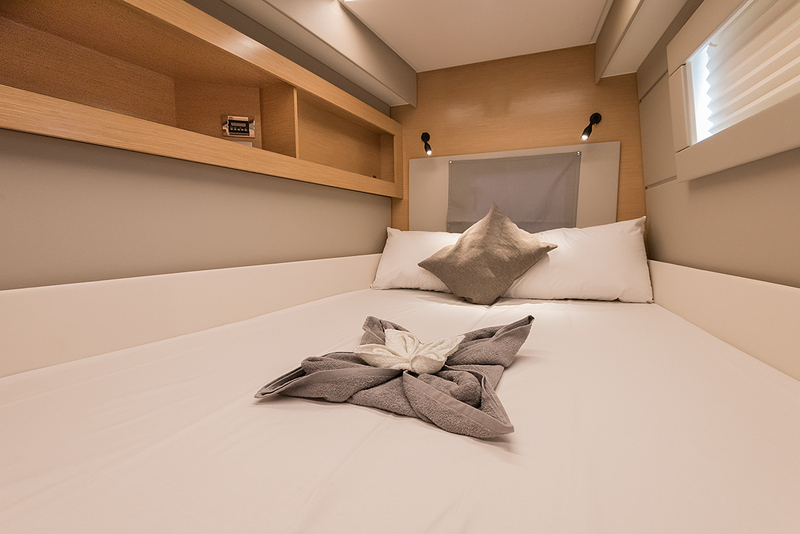 The 46 OPEN is a 3 cabin version of the Open 46 . 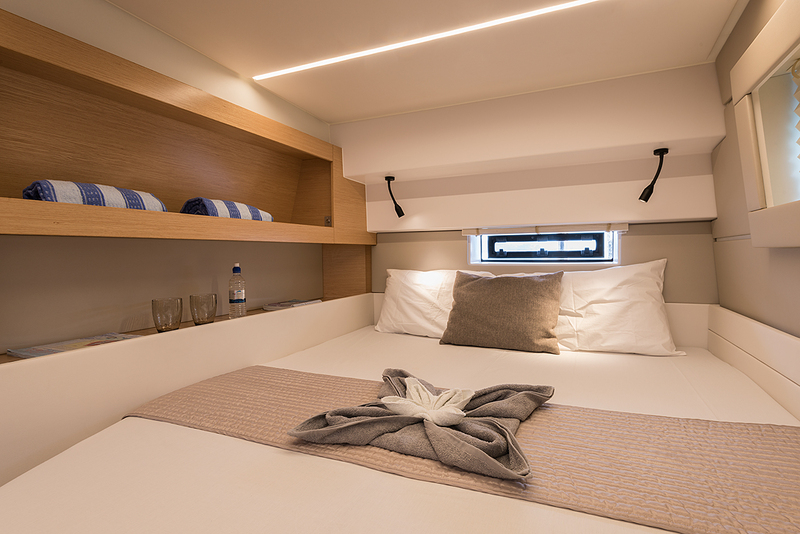 She has 3 heads and an additional 2 single cabins in the V-Berths. 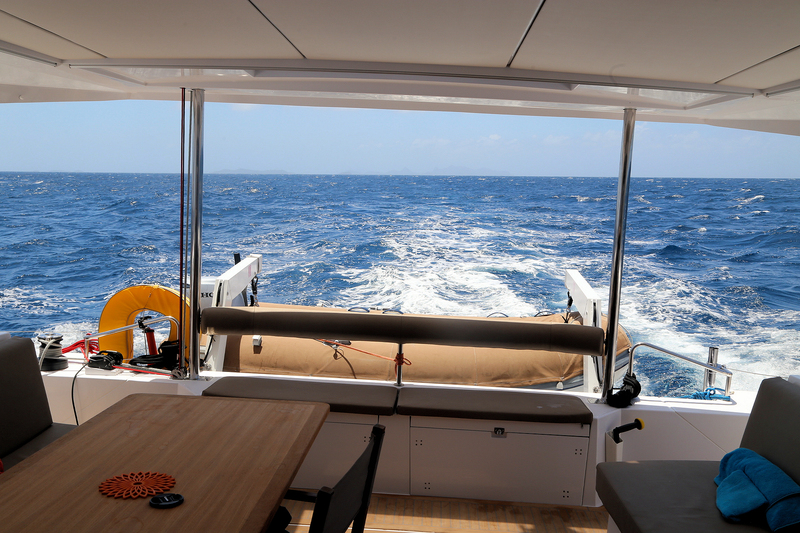 The owners cabin is the highlight down below with incredible space for a 46ft cruising yacht. 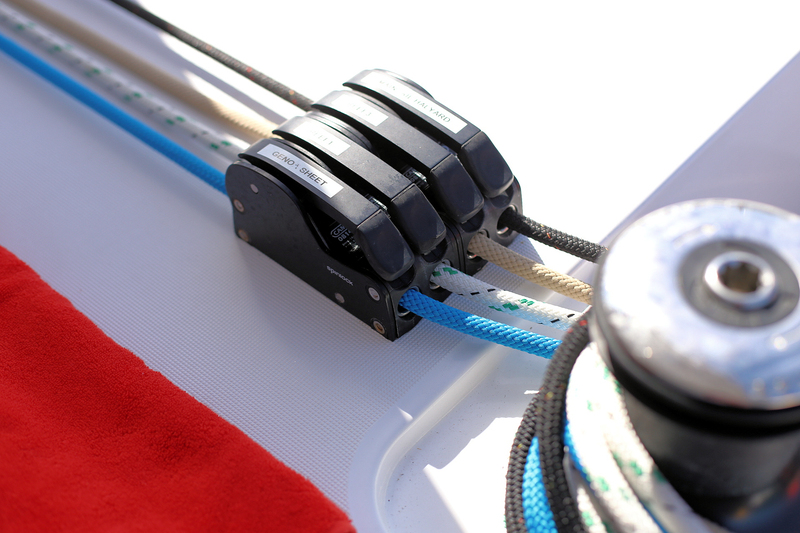 She aims to give a fun and easy sailing experience with an electric halyard winch for hoisting the mainsail and lead back reefing system all operated from the cockpit.